MacKnit was a very short lived American machine knitting magazine (1980s). 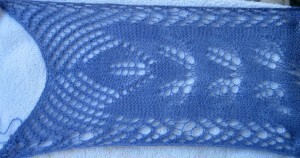 In Number 5, beginning on page 40, Susanna published a lace shawl pattern that included several transfer lace types. Garment shaping was achieved through an intriguing series of triangles joined during the knitting of them. Using her lace graphs, so far I have the resulting swatches below. There are 2 errors I need to sort out; the fabric is intriguing. 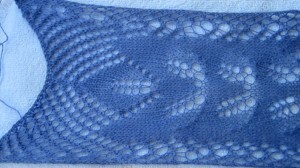 The top pattern rows become the triangular edging. The yarn that finally “worked” for me was the Valley Yarns 2/14 Alpaca Silk blend from Webs. The swatches were very quickly steamed. Lace is one of those fabrics that actually require “real” blocking for best results. Some hand-tooling is mixed in the repeats, stitch formation needs to be constantly checked. Will sort out problem areas, then see where that takes me while keeping any first project as simple as possible.